The 17 Global Sustainable Development Goals (SDGs) define global sustainable development priorities for 2030 and seek to mobilize global efforts around a common set of goals and targets. The SDGs call for worldwide action among governments, business and civil society to end poverty and create a life of dignity and opportunity for all, within the boundaries of the planet. There is much work to be done to understand how the private sector contributes to the advancement of these Global Goals through aggregating corporate environment, social and governance data (ESG data). This project is part of our SDGs Research program, which aims to bring together institutions and students around the world to research how corporations impact and contribute to the SDGs. This project involves researching company performance on SDG 8: Decent Work and Economic Growth. 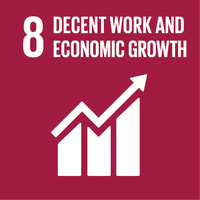 The aim of Goal 8 is to 'Promote sustained, inclusive and sustainable economic growth, full and productive employment and decent work for all'. Once you have signed into WikiRate, you can start researching! Find the company you want to research and hit the Research button. 120 answers have been researched out of a potential 220 (20 Companies x 11 Metrics x 1 Years).